Well, I had heard a lot of talk about the power of the GoodReader app for the iPad and I finally had some time to spend with it. I am currently using the newest version 2.7.7. It is a very powerful piece of software! Created by Good.iware, GoodReader is available for the iPhone, the iPod Touch, and the iPad. Some of the add-on features cost money if you are using it on the iPhone or Touch, but the iPad version includes all of the features for no cost. Okay, GoodReader is a great PDF file reader. However, it can also read Word, Excel, and PowerPoint files. It can hook to MobileMe, DropBox, box.net, and other WebDAV servers. It can interface with iMap and POP email servers and FTP servers. You can move files up and down with it to and from all these places. You can connect to your Google Apps and Google Apps for Ed documents for easy access and transfer of documents, too. You can download Web pages through Safari for offline reading. You can download and play videos and audio files. It will reformat a PDF file as plain text for easier reading if you need it to. GoodReader does so much, you will probably find yourself using it all of the time! It truly is the one of the best $.99 purchases you will ever make for your iPad! I used Safari to download the main page of the user manual from GoodReader's site to my iPad. The only question I have is why the manual is not available as a PDF download for this great PDF reader! Photo courtesy of ChrisDag via Creative Commons licensing. 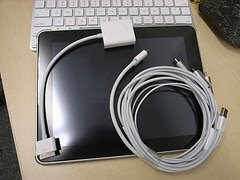 I tried to find a list of iPad apps that will allow projecting via the VGA/composite/component cables and could not find one. I decided to use the power of the crowd to compile a list of the ones that work this way. Here is the direct link to the spreadsheet with the compiled data. Here is the link to the form to fill out once you have checked to see if the one you know about still needs to be added to the list! Thanks for contributing! I have been experimenting with lots of apps-- loading them on the iPad and then removing them. It is so easy to install items, try them out, and then remove them. I did have one major (almost total) meltdown this week. I installed a to-do app on the iPad that syncs with iCal and it immediately blanked out 3 of my 4 calendars; those on my home desktop, my iPhone, and the iPad. Luckily I noticed it and quickly chose to not sync my work desktop, exported the calendar data file with 470 items, and setup all my MobileMe accounts again. It worked, and life was good. I did uninstall the to-do app, even though it had a beautiful interface. I am not sure if I made the mistake or the app took over, but I did not keep it installed long enough to figure that out! I watched another movie via Netflix, played Scrabble with family members with the use of iPhones and Touches, and created some Keynote presentations. I still love the fact that it is so easy to show the students things via the large screen, and I feel like the Pied Piper at times as the middle schoolers follow me down the hallway for their try with the iPad. I recently had a Twitter discussion with an ed-tech trainer who asked me which model schools should purchase. I gave it some thought, and have decided that, if the iPad purchases are to create a 1-1 program, with students having the devices 24x7, I think it behooves schools to purchase the 3G version. Within the current budget constraints, most schools cannot afford the data plan for students. However, if a student or student's family wanted to purchase that service for the iPad, they could easily do that through iTunes. It could be an easy way to get Internet into some homes that do not have it. In addition, since it is a pay-as-you go option with no long-term contract, families could opt-in and opt-out of the monthly fee as needed. There are all types of new iPad in education sites showing up. Here are links to a few. Tony Vincent's Learning in Hand blog items tagged with the word "iPad"
Article: "California school among the first to introduce iPad in classroom"
Article: "Developers seek to link iPad with education"
Cool find for the week: Macworld created the ebook "iPad Starter Guide" and is offering it at no cost on their site. Install it into iBooks and learn the finer points of this great device! I have now spent a couple of days with the iPad and find it more and more useful every day! I am just trying out features as I need them, not testing every little option on the device. I just tried the USB camera connection component and the wired, full-size aluminum keyboard, but the iPad popped up a message that the keyboard accessory took too much power. So, I have moved to the iPad keyboard dock, and it works like a dream! Today at lunch, of course I lugged (okay, carried) the iPad along to show it off. One teacher had a question about Twitter and three of us were comfortably able to view and share the screen when I showed them Tweetie in 2x view-- the big image is a tad fuzzy, but very usable. The teachers were not wowed by the iPad itself, but by the fact we could actually collaborate easily! w00t! I love being an unintentional mentor! 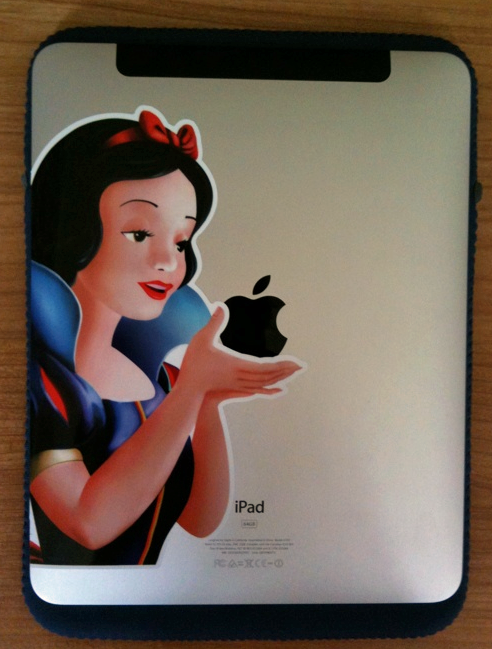 When I wrote my first iPad post, I noticed some weird things about Blogger. After doing some research, I found out Blogger's regular interface does not play well with the iPad, so I purchased the program I am using now, BlogPress, and it seems to work well with the iPad. We will see what the live post looks like in a few! I attended a Discovery Educator Network webinar today via WebEx, and I tried to log-in with Safari on the iPad. That did not work because of the lack of Java support on the iPad. I then downloaded the WebEx app for iPad, but, since Discovery did not schedule their presentation directly through the WebEx meeting scheduler, I could not join via the iPad. The app informed me that I would have to use a computer to view that particular webinar. (This is just a reminder in case you want people with iPads to attend your WebEx!) I will be trying an Adobe Connect presentation tomorrow when I create a meeting on the computer and join with the iPad/iPhone client. It works well on the iPhone, so I am sure it will work on the iPad with no problem. The only thing I am impatient about is waiting for updated iPad-designed versions of my favorite apps, like Tweetie, SlingPlayer, and some others that I use regularly. With the increased screen real estate of the iPad, it is great to see some of the updated apps and how they take advantage of the space to add additional features and/or allow more information to be viewed at one time. That's it for now. Bottom line...it is a fun, fast, intuitive, usable, useful, and the 3G is just the icing on the cake for anytime, anywhere access. I think Apple got it right! It is lightning fast! It moves between apps so fast, I hardly miss multi-tasking. There are times when it would come in handy, but I managed to make liberal use of cut-and-paste to make things work between apps when necessary. Set-up was easy. I followed the advice online and manually moved media and apps to the iPad to allow me to pick the apps that would work best on it. 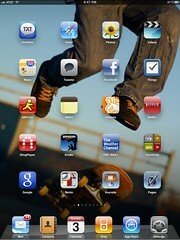 I had a lot of photo apps on the iPhone that were not necessary to install on the iPad. I cannot recommend the 3G version highly enough! I have used it to grade papers in Moodle while waiting in the car and in this hotel room where wireless access is spotty at best. The purchase of the 3G service through iTunes was easy, too. I moved photos of the honors graduation ceremony up to the iPad using the camera connection kit SD card component and it went easily and I was able to both share the photos on the iPad itself and email them to others. It is truly a "different" type of device and it takes a bit to get a feel for it. At first it seemed a bit awkward when I was treating it like a big iPhone. However, once I got past that, I realized it truly is in a class of technology by itself!